February 7, 2015, it was a great day for a field trip; winter sunshine, 58* and a 45 minute drive to the Heritage Flight Museum at the Skagit Airport. 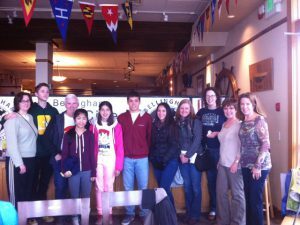 Captain Paul Myers and I , Cheryl Myers the appointed Sister Cities Chair person to Punta Arenas, Chile, picked up our Punta Arenas exchange students in Bellingham and drove southward to our destination. Three high school juniors packed into the back seat of our Subaru SUV allowed for them just about enough room to breathe, providing they placed their lunch stuffed backpacks in the back. The drive, though somewhat uneventful, provided us with a hint at the early spring that was approaching. Many of the fields were already pushing up tulips, a crop that is a huge industry in this local . Hundreds and hundreds of acres of tulip blooms annually provide a spectacular tourist attraction in May, but this year is moved back to April. Sorry our Students could not be here to witness that! 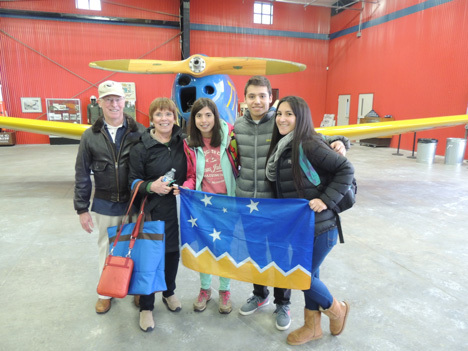 This entry was posted in Bellingham Sister Cities Association, Punta Arenas Chile and tagged Bellingham Sister Cities, BSCA, Chile, Heritage Flight Museum, Punta Arenas. Bookmark the permalink.